Recent court cases across Hertfordshire. Jackie Annetts, 59, of Windmill Road, Hemel Hempstead. On June 19 at Hatfield, having been required to provide a specimen or specimens of breath for analysis by means of a device of a type approved by the secretary of state in the course of an investigation into whether she had committed an offence, failed without reasonable excuse to do. Fined £120, to pay a surcharge to fund victim services of £30, costs of £85 to the Crown Prosecution Service. Michelle Louise Bryan, 38, of Thames Avenue, Hemel Hempstead. On June 18 committed assault by beating. Fined £100, to pay compensation of £75, surcharge to fund victim services of £30, costs of £85 to the Crown Prosecution Service. Thiago Franciso Dos Santos, 33, of Marlowes, Hemel Hempstead. On June 19 at Hemel Hempstead without lawful excuse damaged salon accessories to the value of £280 belonging to Studio Viva intending to destroy or damage such property or being reckless as to whether such property would be destroyed or damaged. Fined £80, to pay compensation of £280, surcharge to fund victim services of £30, costs of £85 to the Crown Prosecution Service. Charley Ann Poole, 18, of Greenford Road, London. On July 4 at Aragon Close, Hemel Hempstead, used threatening or abusive words or behaviour or disorderly behaviour within the hearing or sight of a person likely to be caused harassment, alarm or distress thereby. Discharged conditionally for 12 months, to pay a surcharge to fund victim services of £20, costs of £85 to the Crown Prosecution Service. Joe Robert George Drew, 30, of Typleden Close, Highfield, Hemel Hempstead. 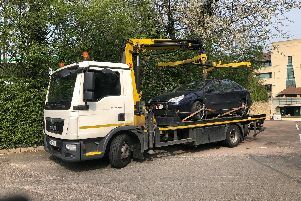 On July 2 at Hemel Hempstead without lawful excuse damaged a police van of a value unknown but under £5,000 belonging to Hertfordshire Constabulary intending to destroy or damage such property or being reckless as to whether such property would be destroyed or damaged. Fined £60, to pay a surcharge to fund victim services of £30, costs of £85.00 to the Crown Prosecution Service. Joe Robert George Drew, 30, of Typleden Close, Highfield, Hemel Hempstead. On July 2 at Hemel Hempstead used threatening or abusive words or behaviour or disorderly behaviour within the hearing or sight of a person likely to be caused harassment, alarm or distress, thereby, and the offence was racially aggravated. Fined £80. Crescent Xolo Mabuza, 25, of Leighton Buzzard Road, Hemel Hempstead. On July 1 at Hemel Hempstead had in his possession 3.5g of cannabis , a controlled drug of Class B. Fined £80, to pay a surcharge to fund victim services of £30, costs of £85 to the Crown Prosecution Service. Drugs to be forfeited and destroyed. Josh Mel Mallaburn, 24, of Fletcher Way, Hemel Hempstead. On May 8 at Hemel Hempstead had in his possession four wraps of cocaine, a controlled drug of Class A. Fined £300, to pay a surcharge to fund victim services of £30, costs of £85 to the Crown Prosecution Service. Drugs to be forfeited and destroyed. Adam Lee Jones , 37, of Bellgate, Hemel Hempstead. On June 9 at Bellgate, Hemel Hempstead, had in his possession a bag of cannabis, a controlled drug of Class B. Fined £80, to pay a surcharge to fund victim services of £30, costs of £85 to the Crown Prosecution Service. Drugs to be forfeited and destroyed. Alan Sebuliba, 36, of Claymore, Hemel Hempstead. On April 30 at Hatfield, having been required to provide a specimen or specimens of breath for analysis by means of a device of a type approved by the secretary of state in the course of an investigation into whether he had committed an offence, failed without reasonable excuse to do. Fined £1,170, to pay a surcharge to fund victim services of £117, costs of £620 to the Crown Prosecution Service.